California is on track to become the first state to ban plastic bags completely, which is a huge accomplishment. 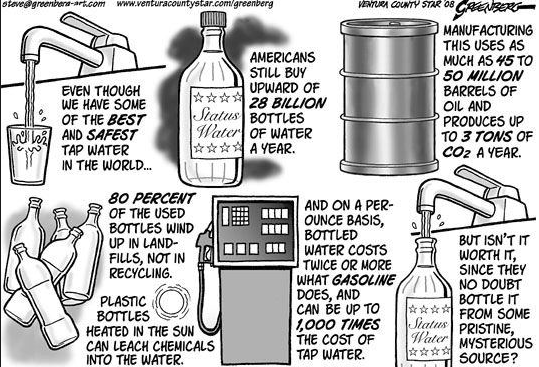 Plastic takes a very long time to break down. In a way, it never really breaks down completely. So when plastic is in the ocean, its process is that breaks down into small enough pieces but it never actually disappears. They mass together due to currents and the ocean movement, and get trapped in limbo. These tiny pieces of plastic that float in the ocean get into the food chain, and then they get into us. 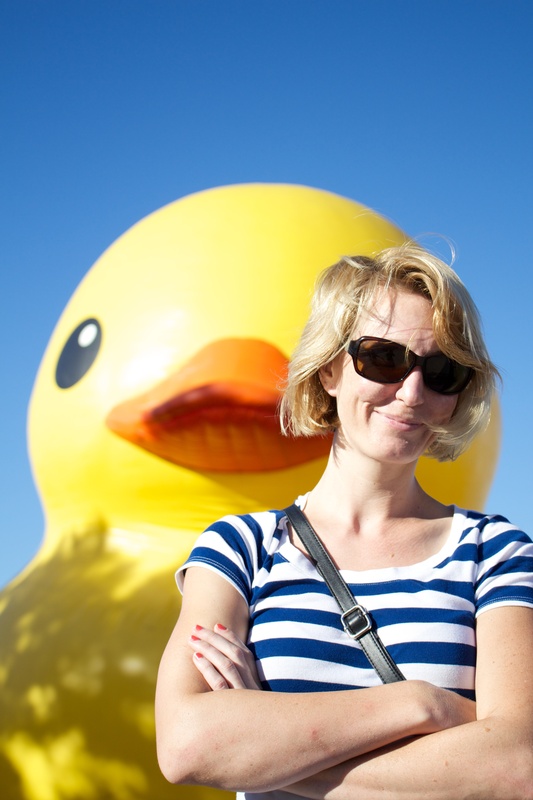 So how does a giant duck have anything to do with ocean plastic and ocean current? In 1992, a shipment of plastic bath toys was en route from Hong Kong to Washington state, but got washed into the sea during a storm. The cardboard casing around the shipment quickly deteriorated and set the Friendly Floatees (the brand of bath toy) loose in the Pacific. Oceanagraphers were already using shipments washed into the ocean to track currents, but the sheer volume of rubber bath toys released all at once provided a good opportunity. Is there something behind me? What? The recovery rate of items tracked through the ocean is about 2%, so of the 28,800 ducks released, scientists were expecting almost 600 ducks to be recovered. It took 10 months for the first Floatees to reach land, hitting Alaska. Over the next 20 years, ducks turned up around the world, even reaching Newfoundland. By recording where and when the ducks touched land, and the state of them, a lot of information was gleaned about how the water in the ocean and moved, and how plastic deteriorated (or didn’t). So one positive aspect was learning the ocean currents, one negative was releasing unrecoverable items into the ocean. 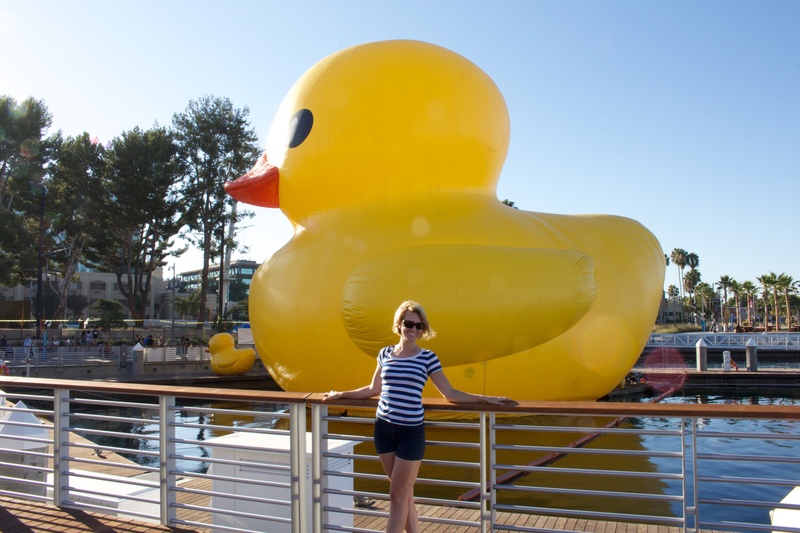 Big Duck making a BIGGER statement. Only about 2% of the ducks were recovered, which means, the other 98% are probably still out there, likely stuck in one of 11 different gyres, which are essentially swirling plastic traps in the ocean. This is just a minuscule example of ocean debris. These Floatees are the cutest possible face of plastic pollution. 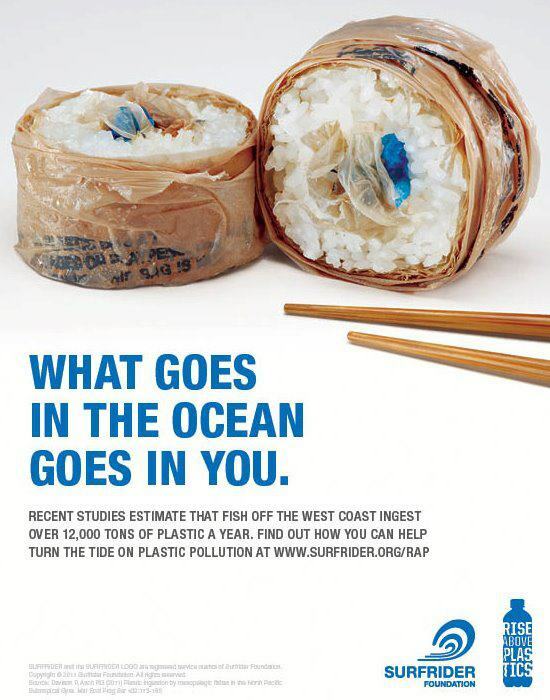 With plastic bags being their evil, ugly cousin. “Each year approximately six billion single use plastic carryout bags are consumed in the County of Los Angeles, the equivalent of 600 bags per person per year. Plastic bag litter makes up as much as 25 percent of the litter stream and significantly impacts our communities and the environment. Due to their expansive and lightweight characteristics, littered single use plastic bags are easily carried airborne by wind, where they end up entangled in brush, tossed around along freeways, and caught on fences. Clogging the throat, thus choking the animal. Artificially filling the stomach so that the animal cannot consume food, depriving them of nutrients. Infecting them with harmful toxins that can poison the animal. So, While we wait for the plastic bag ban to be signed into law, please consider forgoing their use completely anyway. Convenience does not have to dictate your life: keep a spare bag in your car or your purse, or rethink using a bag at all for just a few items. It’s only convenient NOW. It’s not convenient to the environment LATER. Lobster Season Opens: why are 5 people dead already?